Sour cherry season is here. Some of you are thinking "big deal" I know, I get it, you're not a pie baker. That's ok, you're still cool to me. Cherry season is a BIG deal for us. Finding a decent source of sour cherries for cherry pie is difficult. Local supermarkets just don't carry them in the frozen food section. The best you can hope for is a lousy can of them and they are lousy. No one wants mushy cherries before you bake the pie. Today was looking like it would be a bummer for picking. We woke up to an unexpected rain cloud overhead. According to the farm and confirmed with the radar the cloud was localized. A big breakfast was made to prepare us for some serious cherry picking. Every year we say we're going to bring a decent ladder but every year we forget our decent ladder does not fit easily in the van. Every year we leave it at home only to regret doing so once we get to the trees. Nevertheless it does not deter us in our efforts. Keith happily puts one of the big girls on his shoulders and she'll pick as much as his shoulders can stand. We look like a circus family. Another great benefit to clever thinking. I suppose we could have done what some families did and stand on top of our van. Sure a good idea but we'll pass on the dents to the roof. The farm was busy. So many families were there picking cherries. This year like last year was a bust for sweet cherries. Too much rain caused the sweet cherries to plump too fast and waste away. Last year it was the early hot temperatures that caused the sweet cherries to do the same. I could tell there were many there hoping for sweet cherries, they come every year thinking that for some reason the farmer will just show you the secret passage and let you pick sweet cherries. Oh city people you have much to learn about weather and produce. This is the first year where Adelynn understood the concept of picking fruit. She wanted to help out as much as her big sisters were doing. I thought it was great. I love 2 year olds for their eagerness to get on task. Our problem was trying to find cherries low enough for her to reach. Most of the trees were picked through on the low easy to reach branches. After a while of picking I began to realize where the cherries were on the trees. It became clear that few were going inside the tree towards the trunk. I know why it's difficult. no one likes to hunch down and get poked in the face with branches. But....if you're 2 that does not affect you. I hauled the wagon under some low branched trees in a spot where Adelynn could keep herself busy picking. As she stood on the wagon picking I wedged myself between branches picking what I could reach. Once I figured out this plan our picking went so smoothly. Adelynn stopped complaining about not being able to reach cherries the big stopped complaining about having to keep Adelynn occupied, and we all could stay busy collecting cherries. I think I forgot to mention how hot it was out there. The heat was a contributor to everyone's grumpies. Actually it was very humid. The humidity made the 82 degree day worse. 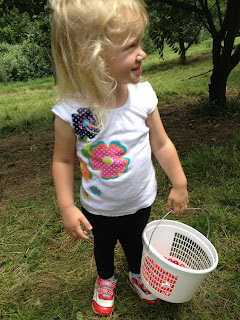 Once we filled out bags we were eager to get out of the orchard. By this point in the day the place was becoming a zoo. Many stayed home thinking like we did that the rain will come making it a bust. By 11am the sun came out for good and the people came rolling in. Good for the farmer but it made it more challenging for parents with little ones. The little kids like to run around tree to tree looking for cherries. Totally normal and perfectly fine for them to do. Kids should do that, it's what you do on the farm. Except for the childless city people who have to drive to every third tree. The city people get in their expensive SUVs and charge down the orchard rows as if they were driving down a city street. Dangerous for kids dangerous for all. 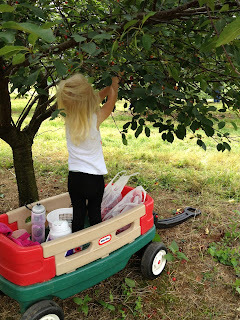 Now that I think about it, I'm really glad that Adelynn wanted to pick her own cherries otherwise I'd been too busy making sure she didn't get smashed by foolish drivers. We love this farm we visit it because we love the family that has farmed this land for over 200 years. What we don't love are the selfish rude people who forget their manners. They take and leave with little regard for the tremendous natural resource this farm has to offer. I don't like to see families spread out these beautiful picnic blankets have a delightful picnic and leave behind bags and bags of trash. Yes you read correctly. They hauled that food there but were too lazy to walk the foot to their car and put the full bag of trash back into the car. When it comes to the trees that's where I get upset. I love trees so much that seeing people being careless around them upsets me. The farmer has posted many signs about not climbing the trees. Montmorency cherry trees are not these enormous grand trees meant to hold an adult's weight. They grow to a decent size with moderately sized branches. 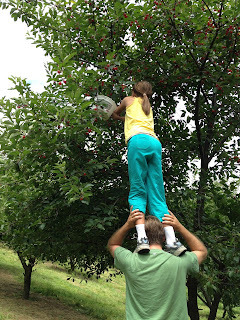 Yet there were so many people up high, too high, in the trees picking cherries. The result? Every 5th tree had a significant branch broken. Significant as in 6 inch diameter branches. I find it heartbreaking. I wonder what the 'ol farmer thinks at the end of the day? He and his extensive family have put in so much time and devotion to their beautiful productive farm. Seeing the broken branches and piles of garbage in the orchard must hurt him and his family so. Farmers are a tough lot. They look at the mess see the tasks ahead and make plans to repair or clean. I'm impressed with this family's generosity. Every year they have been seeing these behaviors and every year they open up their farm to all of us. I think we could all learn something from their kindness and perseverance. Look at that pile of cherries! That was my second pile that needed to be pitted. By hand. A long process but worth the effort. 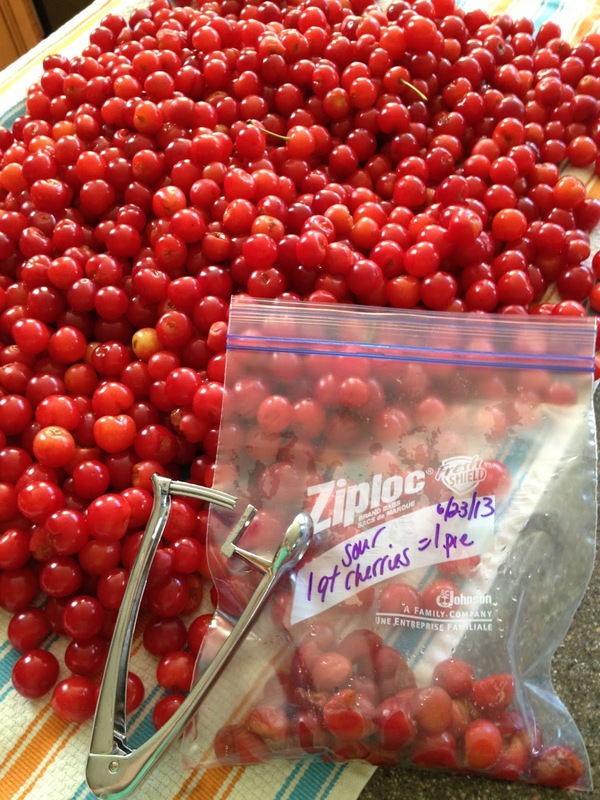 I could use a high number pitter but using this cherry/olive pitter yields a better fruit. I have hours of work to get those whole pit-less cherries ready for pie. This year's picking yielded 8 quarts of cherries. That's 8 pies. A pie for nearly every month. Oh yeah, delicious cherry pie.